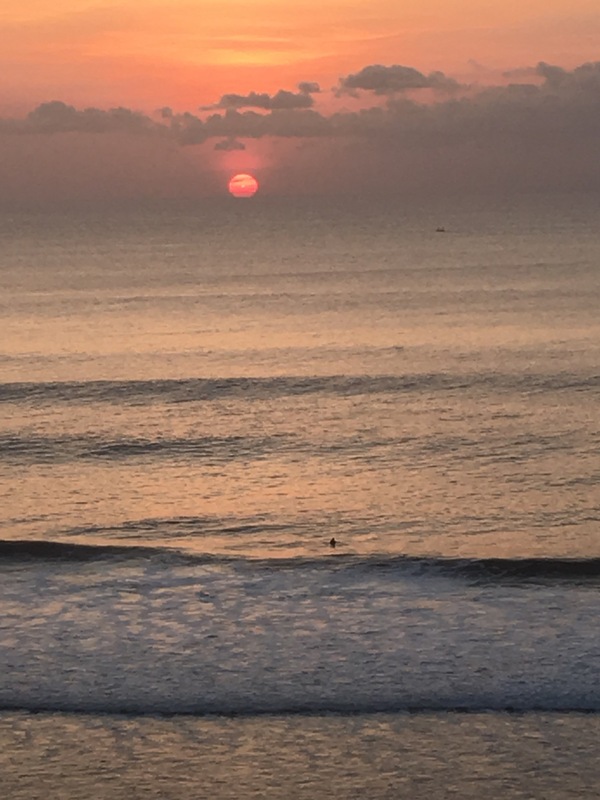 SANUR, BALI, INDONESIA: SEPTEMBER 13-OCTOBER 12th. Our first week! 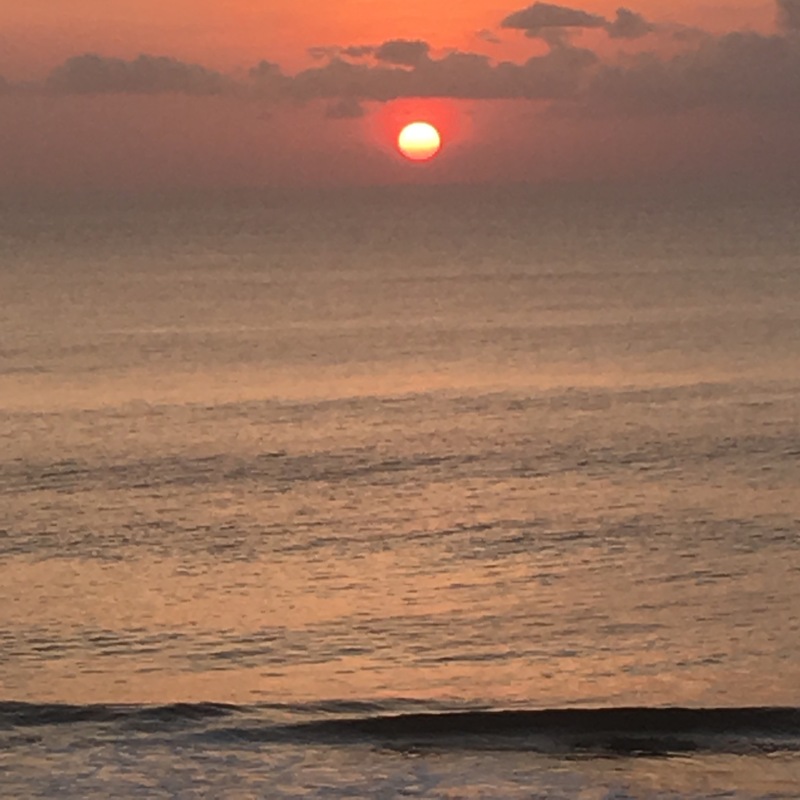 Bali, rarely disappoints and especially not when you’ve arrived business class. Having secured these flights in the Boxing Day sales ( hard to turn down $426 each for business class) we were looking forward to experiencing the ” turn left” when entering the plane. 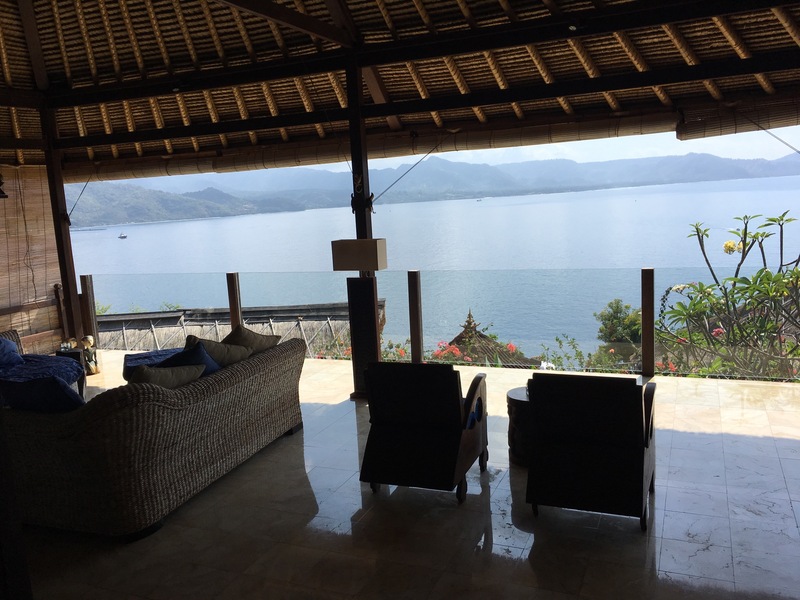 It certainly felt worth the price tag with the extra leg room, champagne and other little luxuries that we don’t normally have and it was a relaxed and happy couple that arrived in Bali to our waiting driver. This is our third time to Bali together, James fourth and my fifth in total. 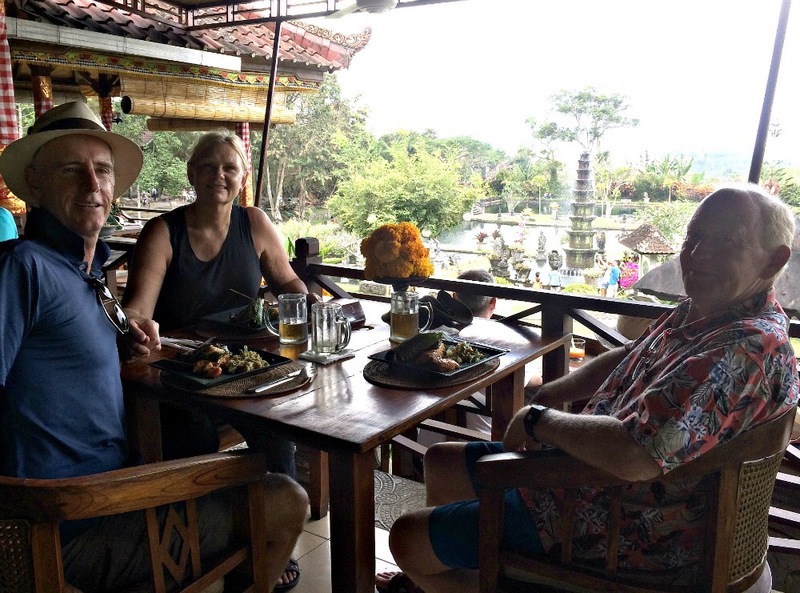 We have stayed in Sanur each time we have been here together. 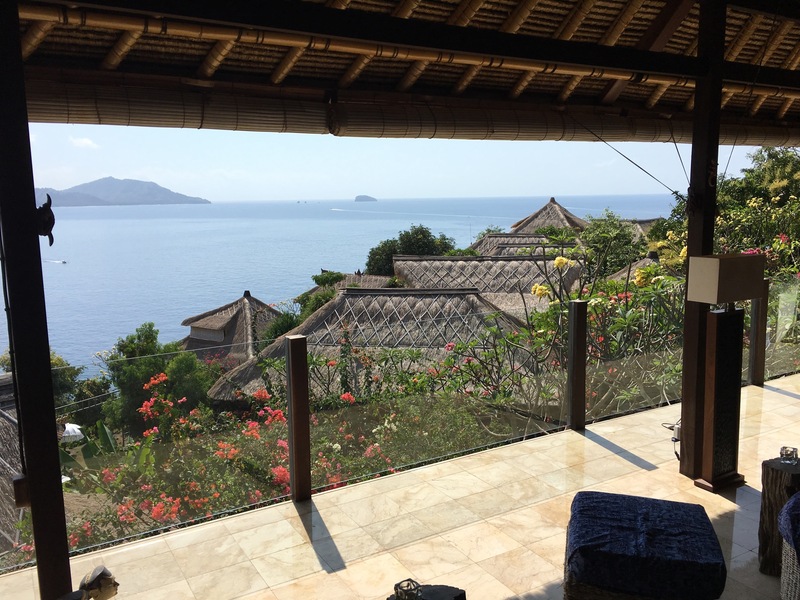 ( we’ve also spent time in Ubud and Seminyak). We feel very comfortable and instantly in our comfort zone, like putting on your favourite slippers and start settling into our 30 day stay. 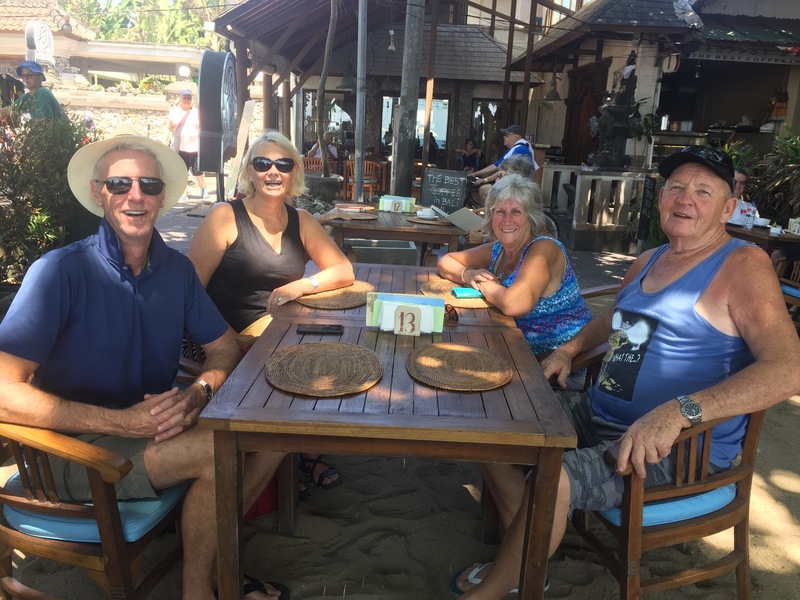 Having announced on Facebook that we were here should anyone wish to catch up it was thrilling to have a message from our buddies Cheryl and Phil Basley from W.A that they were not only in Bali but also in Sanur! With them leaving Thursday afternoon for home we quickly secured a coffee date and were pleased that their favourite coffee spot on the waterfront was also the one we also favour when here. We haven’t seen them since meeting them on our honeymoon tour of Europe in 2010, though we keep in contact via Facebook. Cheryl is a one in a million sweetheart and Phil is the most gorgeous Aussie fella that anyone who has them in their life is blessed. That 2010 tour secured friendships that go beyond countries, ages, cultural and religious backgrounds and we are hopeful that there will be a reunion tour sometime, ( will need to get that sorted). 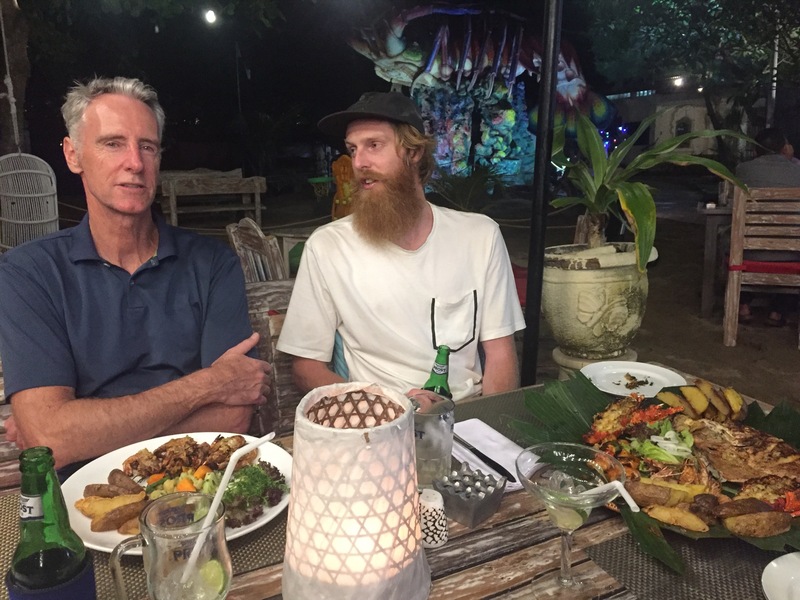 That afternoon was seeing the arrival of Michael and Maani ( James son and girlfriend) to stay 3 nights in Sanur allowing us to have some quality catch ups. 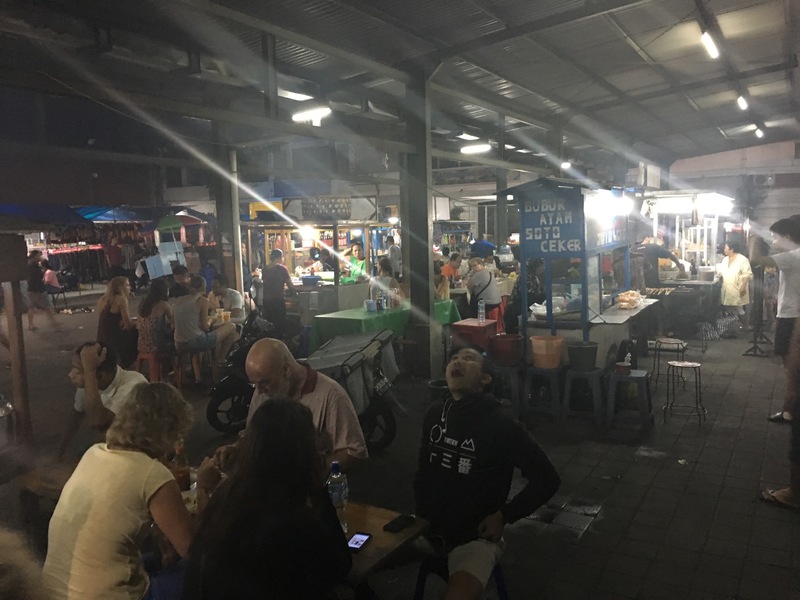 That night we took them to the local night market for dinner, our favourite eating place where chicken soup filled with vegetables is $1 and 10 sate sticks usually less than $2. It has a great vibe and frequented by locals and tourists. Old neighbours of James and friends to us both Lynn and Steve Bolton have been holidaying in Nusa Dua at the very luxurious Sofitel and had invited us all over for a visit, by coincidence their son Mitchell and Michael share a house together so it was great to all hook up in Nusa Dua for a few hours floating in the incredible pool there. The pool is accessed from right outside their villa you walk out on the patio and walk into the pool, like an alleyway leading into the main pool via lush gardens and under bridges, totally cool. That night was football and after a disappointing loss from Penrith to the Broncos, Maani helped make the decision for dinner on the beach. Great choice and very happy bellies that made their way home that night. It has become our habit after breakfast to walk to the coffee shop on the waterfront for a little slice of people watching and relaxing with our coffee and or juice before contemplating what else we’d like to do. The young folk were off exploring and we met up at the Glasshouse ( another previous favourite of ours) for happy hour ( really 3 hours) cocktails and beers before the boys went on to watch the football, this time Parramatta loosing to the Cowboys! Not thinking that venue is good luck for them to be honest. Maani and I decided it was time for some girl time and we headed off for Maani’s first facial. The spa was quite professional and although I thought the girls a little firm handed than I’d have liked we both managed to fall asleep while waiting for our masks to dry, so I think you could say it was all told a fairly relaxing experience. We joined the boys for the last half of the game and then went on to The Porch restaurant for dinner with a stop at the MONA LISA restaurant for desert, we had had coffee there previously and seen they did creme brûlée which James and Maani had, again a first for Maani. 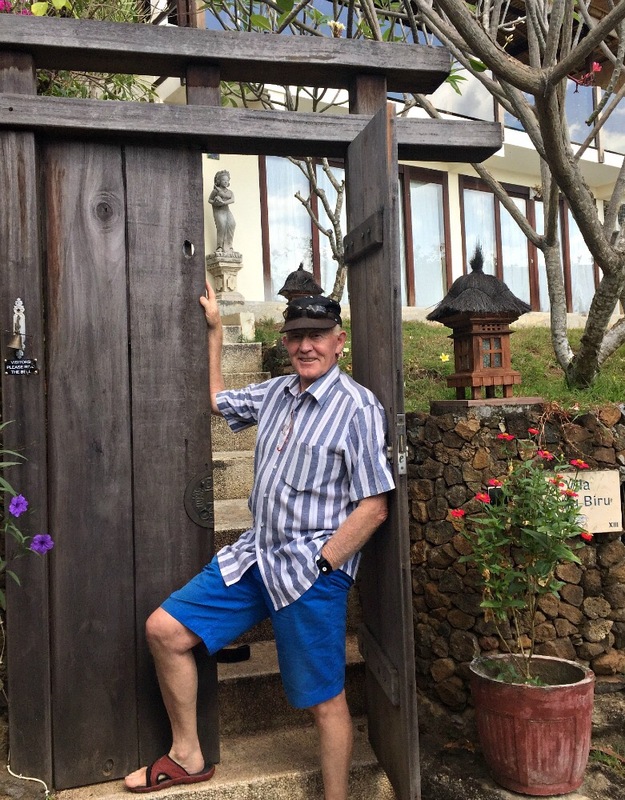 Young folk were heading off to Uluwatu for their final days of holiday and we booked a driver to take us to Padang Pai to visit our friend Eric at his and wife Jacqui’s villa there. 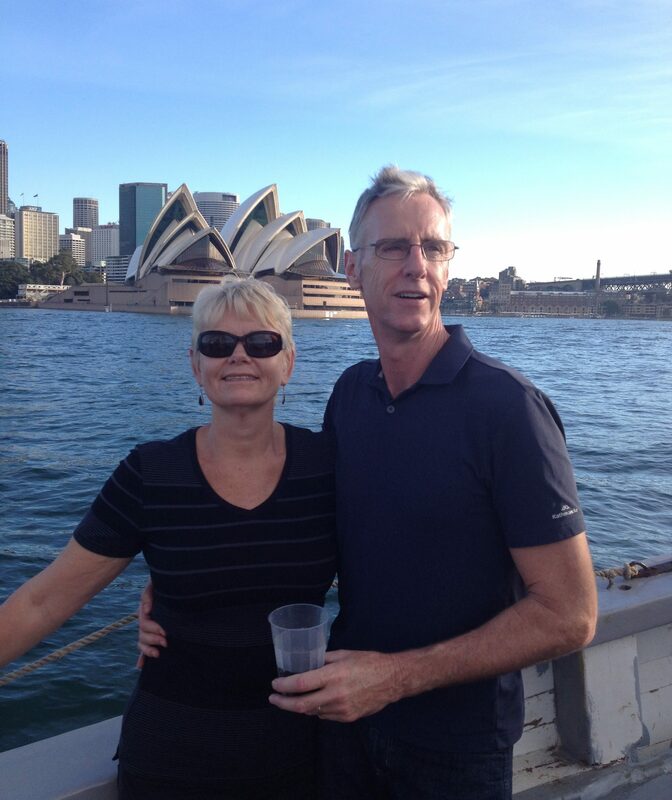 Unfortunately Jacqui had already returned home to Woy Woy but we had a fabulous overnight stay with Eric. After being WOWED by their view. 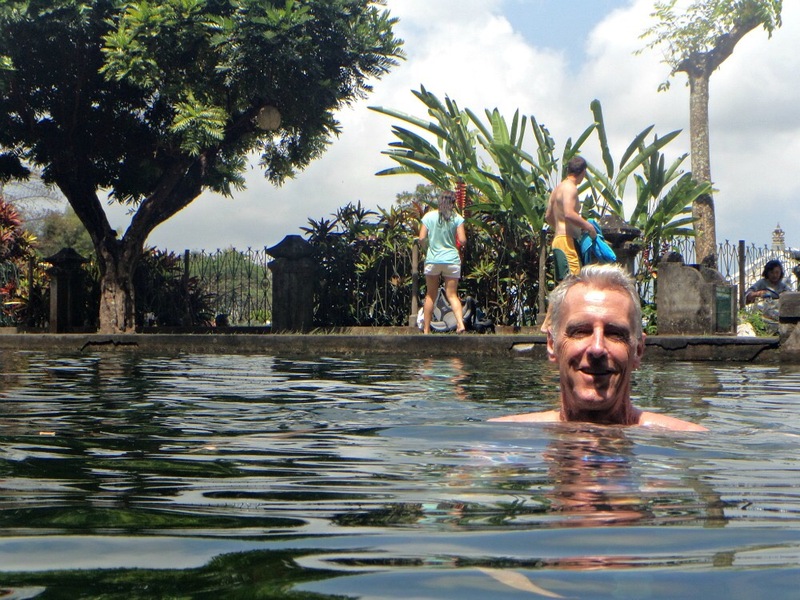 We took off in Eric’s hire car to the Palace waterfalls to swim in the Kings pool and have lunch there. Glorious! A little snooze back at the villa followed by drinks upstairs before heading off to the resort restaurant completed a wonderful day. A relaxed morning breakfast on Sunday bought us to time to say goodbye to the Villa Henry at Bloo Lagoon. 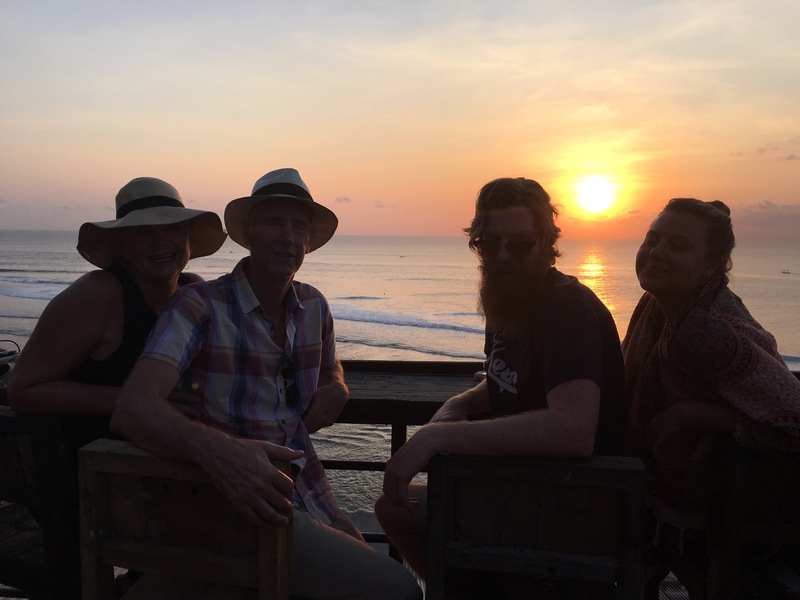 Eric drove us back to Sanur and was only fitting that we should take him to our coffee spot before he headed off back to his little slice of paradise. Thanks for the stay Eric it was fantastic. We dined at the local market that night and slept like babies. After our ritual coffee stop we walked along The waterfront for about an hour before turning back and stopping for a couple of Bintang’s and chatting with a couple from the U.K.
We had arranged for a driver from our guesthouse to drive us to Uluwatu for a five pm catch up with Michael and Maani for their last full night and to watch the sunset from the bar at Single Fin where Michael had made a booking, great idea it was packed and we had a great view as we sipped down a few cocktails and beers and sharing plates before we finished off with dinner there as well. I can highly recommend the pineapple marguerita’s. 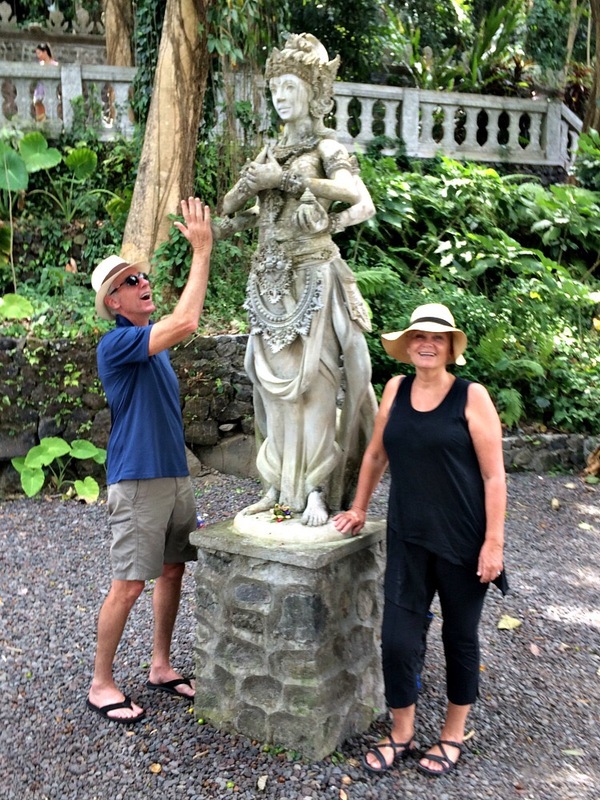 We’ve really enjoyed our time with Michael and Maani as we have catching up with our friends as well. Hard to believe that tonight, the 20 th marks only our first week here. There are no more catch ups that we know of so we’ll get down to the gritty of everyday life of ” Offtolivetheworld where budgets must be looked at, planning for next few stops must be done and I’d like to get back into my Duolingo Spanish. James has his new beaut Ukele to get out of its case and there’s walks and coffee and books to get read as well. Ahhh life on the road. 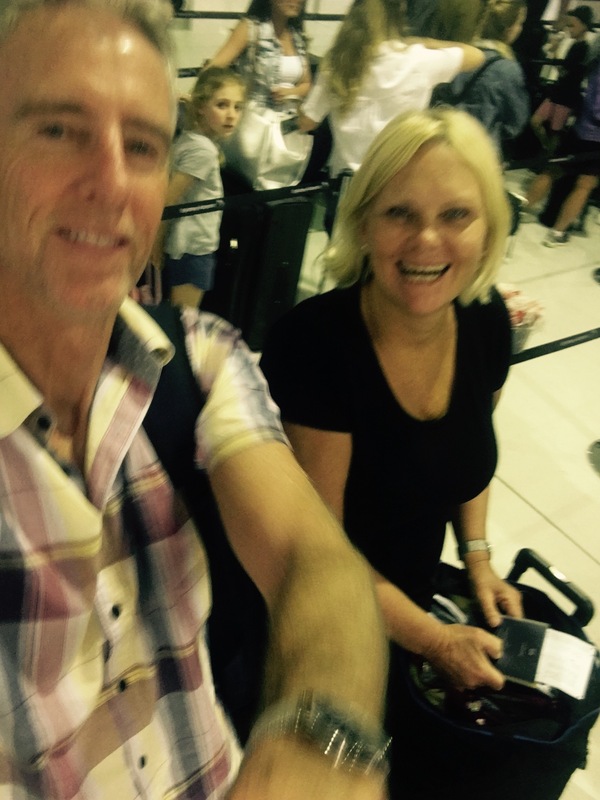 We arrived home to Sydney Australia to beautiful blue skies and temperatures of around 24 degrees. Sunday Father’s Day went up to 29 degrees. Though the wind during the week did give some concern and at 3:30 am one night we made the decision to get out of bed and take the awning down. The awning down, I hear you saying. 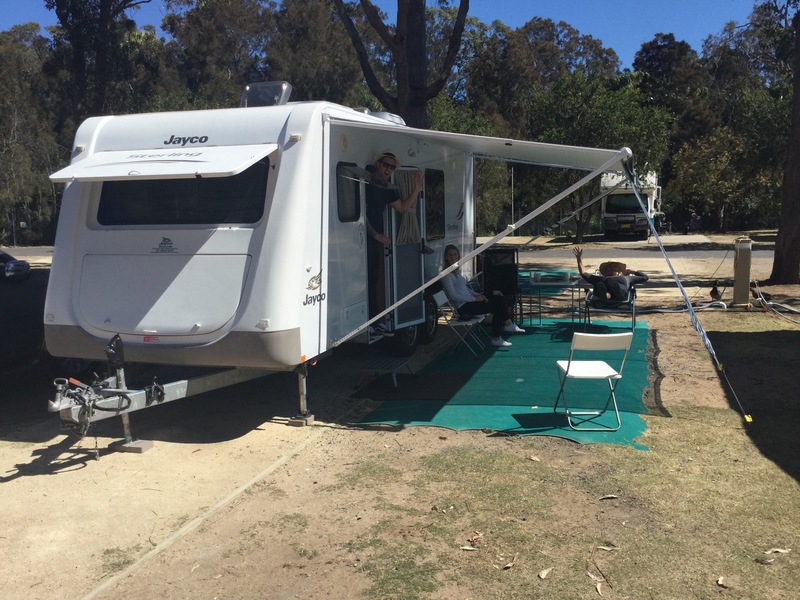 Yes we are in our caravan for these eleven days at the beautiful Oceanbeach caravan park. What a great place for families and I have to say during the weekend when there have been plenty of families in, we’ve been impressed with how quiet the kids are in the morning. Expecting to be woken by 6 am by happy kids laughter it’s been closer to nine before we hear chirpy little voices. 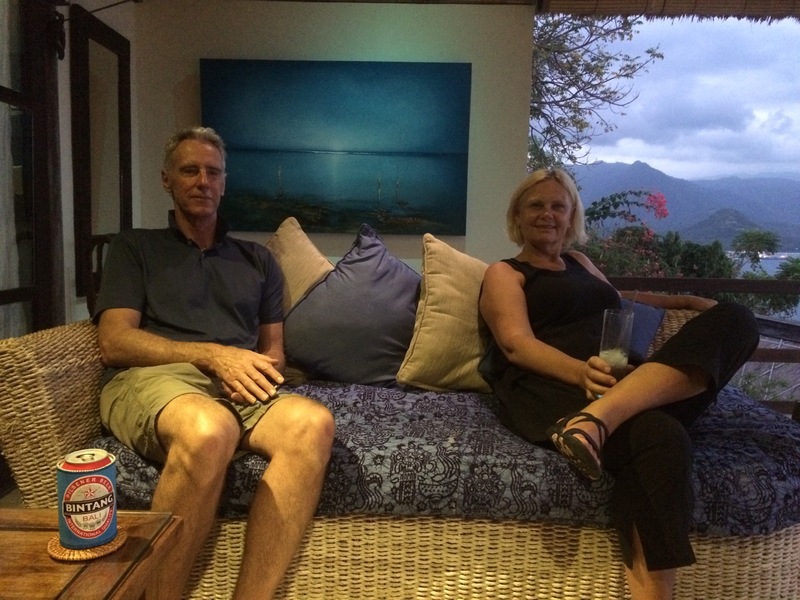 It was a long day that first day, off the ship on the first list to disembark and by noon we had been shuttled back to Umina where we said a quick hello to James daughter Jackie and her partner Adam, picked up the truck and picked up our caravan from storage at Wyong. It all went very smoothly and by 4 pm we were set up, had had our first burger and chips from the surf club and were snoozing away for an afternoon rest before heading to stock the fridge early in the evening. SUNDAY bought those beautiful 29 degrees but not till late morning and after tidying up our little home we were ready to welcome our first visitors David and Janine. Not too long after they arrived my son Scott and the lovely miss Tina joined the party and we headed to the surf club for another of those ginormous burgers. We walked along the beach a little way and back through the village, saying goodbye to Scott and Tina and having a beer at the local pub before calling it a day. MONDAY ONWARDS: This is when the foot hit the pedal to the metal and we began in earnest making headway into our long list of “needs to get done” before the 13th. Doctors,dentists,accountants, real estate agents, travel agents, renew drivers licences, pay bills, car services, hairdressers and so much more. Catching up with family and friends has also been high on our list and we made dates with as many as we could fit in. It’s always sad to not get the chance to see everyone but our time constraints and what we needed to get done only allowed so much. As it was I was hit by severe laryngitis and a heavy cold within two days of arriving back in Australia and it curbed my ability to even attempt to fit more in. Hopefully we will get visits from some people when we’re overseas. Hint hint. Pleased we got to see the three children whom were in Australia at least once (Chris) twice (Scott) and Frequently (Jackie). We emptied our suitcases and began the hard and ruthless decision of what to take on our next trip and what stayed behind. We have a criteria of ” this goes with that goes with everything “. Toiletries are kept to the total barest minimum as you can buy these anywhere in the world. As we will be going from Asian hot climates to a European winter we have had to be even more careful about what we take as we need to have enough warm clothing to get us comfortably to the first shopping centre in Germany where we will purchase some warmer pants for our 5 weeks in Europe. It’s all about the layers. I have three thermal tops. One which is a polo or turtle neck, one silky thin layer and one Marino. These will also be my long sleeve tops to wear any where needed. I have two layers of thermal pants, one silky thin and one Marino. Again this gives me the option of wearing them as leggings under skirts and dresses. I have a buff, gloves and wool beret also packed along with thick wool socks to wear with my apris winter boots which I am also taking with me. And we each have our puffer jackets which roll up to minimal space and a long plastic raincoat which took us ages to find. I’m taking a few items I’ll ditch once we head up to cooler climes and we can continue to do this as we travel around adding and leaving behind as we find we need to. We do hit Australia for two days next February so will be able to do a reshuffle then with clothes we have in storage. I’m using TripIt to log our trip details as it gives me the easy option of listing addresses, phone numbers, flight details etc and it instantly logs the flight details once you put in the date and flight number. We also photograph lots of details as well as carrying paper copies of necessary items. Digitally we both have our I phones (James has also bought an old one for putting in local SIM cards when we feel that’s the best way to go) we paid a $60 yearly prepaid which kept our numbers and gives that amount of credit when needed. We also have our iPads and James has his kindle, we have a great charger that will take us round the world with all the different connections required for power points. Before we knew it time had zoomed by and it was time to clean the caravan, and put it into storage till next time we’re home for a proper stay. We spent our last night at our friend Cathryn’s home with her and Miffy the dog and tearfully waved goodbye on the Wednesday morning of September 13th 2017 as we made final preparations and took the train to the airport after also waving off Jackie and Adam whom had given us a lift to station.